Christianity is based on the teachings of Jesus. Jesus lived about 2000 years ago on the eastern shore of the Mediterranean Sea in the Roman province of Judea. Most Christians believe Jesus to be both a man and the son of the God of the Jews. Almost two billion Christians live on every continent. Christians comprise the majority of people living in North and South America, Latin America, Europe and Australia. Additionally, Christianity is the religious faith of almost half of the people of Africa. Christianity is a dominant force on every populated continent but Asia. Our calendar numbers the years from the birth of Jesus, but many scholars now believe Jesus was born about 4BCE. Jesus began to minister at about the age of thirty. Jesus was a Jew, but his teachings sometimes did not agree with Jewish tradition. Jesus called on his followers to “do unto others as you would have them do unto you.” As Jesus developed a popular following, both the religious leaders and the Roman governor saw him as a threat to their power. Pontius Pilate, the Roman governor of Judea, ordered Jesus to be crucified. Crucifixion is an ancient and painful method of execution in which a condemned person is tied or nailed to a wooden cross and left to hang until dead. Today the cross is Christianity’s most important icon. A cross is found at the top of most Christian churches. Some Christians wear a cross as a necklace. The cross symbolizes a Christian’s connection with Jesus. The followers of Jesus called him Christ. Christ is a Greek word that means, “chosen one.” In time, the followers of Jesus became known as Christians. Some years after his death, a group of Christians combined the stories of the life and wisdom of Jesus into four books known as the Gospels. Gospel means “good news.” The holy book of Christianity, the Bible, is composed of two sections. The Old Testament consists of the sacred writings of the Jewish people and was written mostly in Hebrew long before Jesus lived. 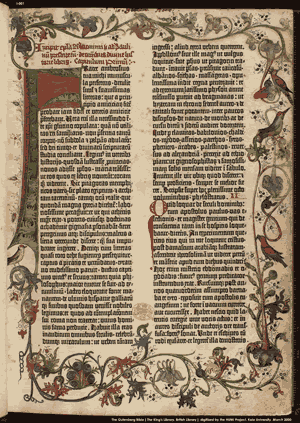 The New Testament of the Bible includes the Gospels, along with letters by Christian writers. The Bible has been translated into more than 1,500 languages and has been read by more people than any other book. About half of the world’s Christian population is Roman Catholic. Pope Benedict XVI is the leader of the Roman Catholic Church. Catholic is a Latin word that means “universal,” and at one time almost all Christians followed the teachings of the Pope. Roman refers to the fact that the Pope has lived in Rome for over five hundred years. Most Christians in Eastern Europe belong to Eastern Orthodox Churches. The Eastern Orthodox churches split with the Roman church in the Middle Ages. Many European leaders, including Martin Luther, John Calvin and King Henry VIII of England, protested against the Pope in a period known as the Reformation. In addition to Roman Catholicism, Christian sects in America today include Baptists, Methodists, Lutherans, Presbyterians, Pentecostals, Mormons and Episcopalians. Christian holy periods include Christmas, the birth of Jesus; Easter, when Christians believe Jesus rose from the dead and ascended to heaven; and Lent, a forty-day holy period of penitence and self-denial. Christians generally worship in churches led by ministers and priests. Most Christians practice acts of religious significance called sacraments. The sacraments include baptism, when a Christian joins the church and confirmation, when a Christian confirms his or her faith. The Eucharist is the holiest of Christian sacraments in many Christian churches. During a religious service, members of a church will eat a small wafer of bread. Christian tradition states that at the Last Supper before his execution, Jesus asked his followers to think of the meal as the body and blood he would soon sacrifice. Mr. Donn has an excellent website that includes a section on World Religions. The cross is the best-known symbol of Christianity. It seen as a representation of the instrument of the crucifixion of Jesus. 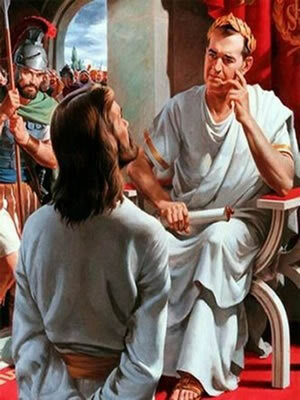 A painting of Jesus before Pontius Pilate, the Roman governor olf Judea. This entry was posted in Western Religions. Bookmark the permalink.